Can this product be used with domestic washing machines...i.e non auto dose machines? This product is suitable for both auto dosing and non auto dosing machines. Highly effective on stain removal, our Gompels Non Bio Laundry Liquid offers exceptional value for money. The large 10 litre bottle can be stored away or decanted into smaller containers for the most convenient use. The powerful formulation has been blended with cleaning agents that target stains and soils to leave all linen feeling clean and fresh. Active ingredients also work to ensure the softest touch to each item of clothing while the strong mixture reduces or eliminates the need for repeated washing or soaking. 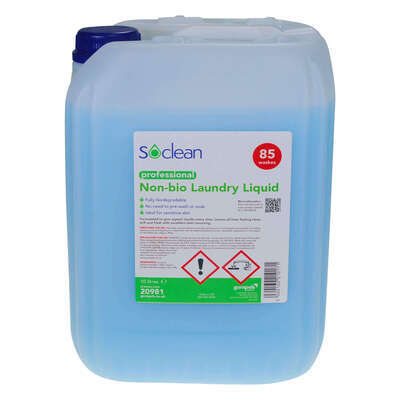 Suitable for use with autodose machines, the large bottle of laundry liquid has the potential to produce approximately 85 8kg washes reducing your replenishment costs and ensuing your stocked up for a significant period of time. Here at Gompels, we stock a range of alternative washing products from the Laundry Powder version of our non-bio through to the industry leader, Bold Lavender & Camomile Powder.